Revamp from your wardrobe with happy, shiny shoes from this shop on Kammnahalli’s Nehru Road. They have stylish formal shoes that will pair splendidly with that sharp suit you just bought. Their colourful lineup of loafers will brighten up your casual look too. And the prices start at just INR 1,000, so you won’t hear your wallet complaining either. Walk down the road and Leather Forum is great too for shoes and accessories. The Kammanahalli-Kalyan Nagar belt is brimming with export surplus shops that offer great bargains. For men, Brand Club is great for everyday wear. You can pick up hoodies and tees from labels like Hummel and US Polo. If you are looking for semi-formal shirts with out-of-the-box print they have those too. This store also has a great collection of jackets for men, from Diesel and Calvin Klein, starting at just INR 1,999. 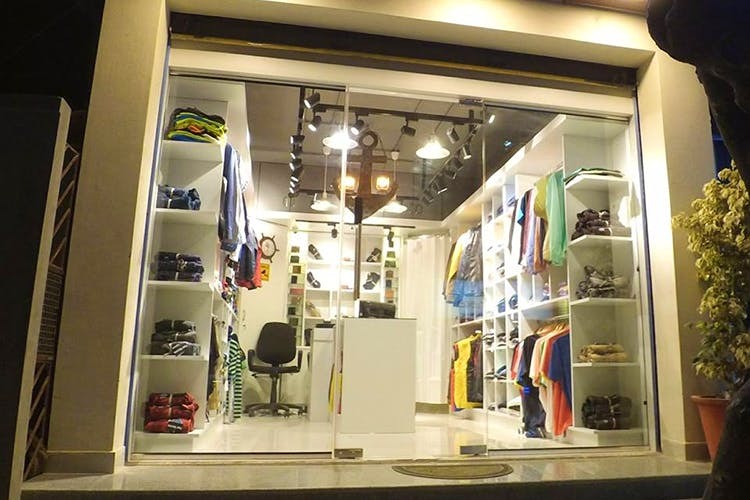 A small store located on Kammanahalli’s Ganesh Temple Road, Fashion Land specialises in boots of all shapes and sizes. The ankle length ones are especially great if you are on a budget and want something to pair with your denims. They have rows and rows of formal shoes too. Looking for quality gym wear that doesn’t break the bank? Then, Route 77 is the place for you. Another export surplus shop, you can get the usual shirt and trouser combo here. But we recommend you focus on their range of shorts and tees from the likes of Adidas and Nike starting at just INR 549. You can also snap up gym bag from Superdry for a little more than INR 1,000. Dedicated to menswear, Pour Homme specialises in export surplus goodies. Walk out with shirts from Ralph Lauren and Massimo Dutti starting at just INR 1,000. Spiffy jackets and denims are an option too here. Wallets and other accessories are also available for a steal. Nearby, you can also check out Wardrobe for offeings from FCUK and Tommy Hilfiger beginning at just INR 895. This is a great place to pick up stylish briefs for less than 300 bucks. Every evening, a little ahead from the Church on Kammanahalli Main Road, a van vrooms in and kicks off business. Stop by and you can sift through a mound of sneakers from various brands (some well known, others not so much). Depending on their stock, you can walk home with simple, white sneakers or neon shoes that are perfect for the running track or trendy laceups that are perfect for casual Fridays at work.